Karel 4 life! Fo shizzle! The word "robot" was invented by Josef, Karl's brother. Yes, Josef is credited with inventing the word and Karel is credited with popularizing it in his play R.U.R. Can one still buy plastic Karels? I'd love one for my collection of Karel-related materials. 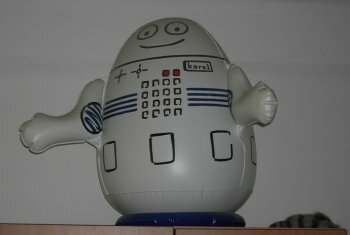 You can no longer buy these Karels, mine is over 20 years old and - incredibly - he still holds his air!